The GNLF today said it had found a common ground with the Trinamul Congress to take on Bimal Gurung in the hills and was confident of strengthening the alliance with Mamata Banerjee. Mann Ghisingh, the president of the GNLF, today led a six-member delegation that met Mamata at Nabanna for nearly an hour and discussed issues concerning the hills, like granting tribal status to 11 communities and the dues of workers of three tea gardens owned by the Trinamul Congress MP K.D. Singh. After the meeting, Neeraj Zimba, a central committee member of the GNLF who was part of the delegation, said: "Whenever we feel we cannot go alone, we will go with TMC. There is no formal alliance yet and we might not be natural allies. But we have found a common ground." Asked about common ground, Zimba said: "There is a need to end corruption in the hills and bring about better administration that Bimal Gurung has not delivered. As far as formalising the alliance is concerned, our party president will take a call as and when its needed." Zimba was hinting at an election-centric alliance rather than a long-term political front. Even though the GNLF had supported Trinamul during the 2014 Lok Sabha elections and the recent Assembly polls, the party has not been able to cement its relations with Trinamul. GNLF's apparent closeness with Mamata comes at a time Gorkha Janmukti Morcha president Gurung, too, is keen on establishing a working relation with the state government. Sources said the Morcha was keenly following the Mamata-Mann dialogue. The delegation today discussed a number of issues with the chief minister. "We talked about the demand to grant tribal status to 11 hill communities, problems in tea gardens owned by Alchemist Group, the closure of NH55, voluntary teachers' jobs, corruption in the GTA and regularisation of employees of the hill body," said N.B.Chhetri, the spokesman for the GNLF. Chhetri claimed that Aroop Biswas, the Trinamul leader in charge of the hills, had assured that tea garden workers' dues would be cleared within 15 days. 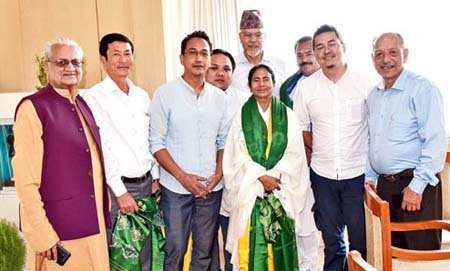 GNLF today said it had found a common ground with the Trinamul Congress to take on Bimal Gurung in the hills and was confident of strengthening the alliance with Mamata Banerjee.